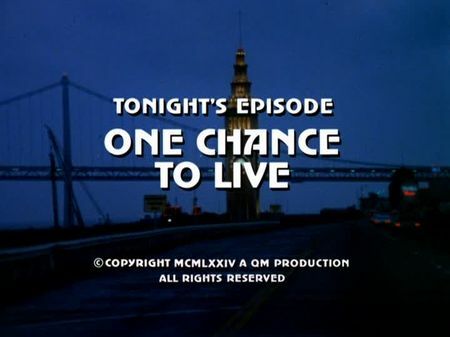 The screencaps for One Chance to Live have been added to the episodes' page. Mike and Steve are set on the murder of a pawnbroker when they are responding to a nightly emergency call. A woman has called police as she was harassed and even threatened by a stranger who obviously tried to run her over with his car. Our two cops take the lady home, with Mike being pretty convinced that Martha Howard is just a lonely maiden woman seeking for some attention, whereas Steve takes it far more seriously. While checking a lead on their murder case the next day, police receives another call from Ms. Howard which Steve responds to. To all his surprise, Martha Howard recorded a threatening call she had received just an hour ago, proving her earlier calls were not just the fantasy of a lonely old maid. During their investigation on the case, Mike and Steve have to clear up several secrets and mysteries, and Ms. Howard's discretion almost puts her life at risk. Furthermore, the suspect turns out to be quite tricky in accusing Steve of police brutality. There are numerous locations for this episode. Martha Howard is pursued by Bobby Nelson in North Beach at night, whereas her apartment is located in the Pacific Heights district. She wants to pick up her love affair at San Francisco's Interational Airport Pier F, and has lunch with Brian Downing at Alta Mira Restaurant in Sausalito. Steve sleuths a hint in the pawnbroker murder case on Nob Hill before he gives Mike a call using a telephone booth at the northeastern corner of the California and Mason Streets intersection. Bobby Nelson's apartment is located in North Beach again, and so is the restaurant where Mrs. Downing meets Ms. Hanson in order to clear up things. We are also taken to City Hall and the Golden Gate Park. Last but not least, Bobby Nelson seeks a group of young guys hanging around in front of a coffee house on Broadway in order to provoke the brawl which gets him the wounds he "needs" for his accusations of police violence.